Among seasoned law enforcement agents and self-defense aficionado's Federal's law enforcement buckshot loads featuring their Flite Control wads are considered at the top of the class for quality. 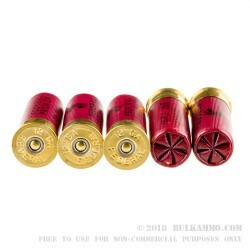 This ammo features 9 pellets of 00 buckshot that stay in a tighter grouping than nearly every other buckshot load out there helping to transform your shotgun into a precision shooting tool without any aftermarket chokes. 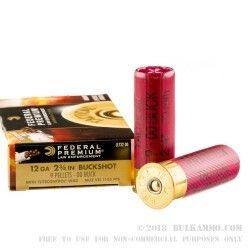 The key is Federal's Flite Control wad which has revolutionized the way that buckshot exits your muzzle helping to keep the buckshot column together in a tighter pattern reducing the chance of fliers. This LE132 00 ammo has a muzzle velocity of 1,145 feet per second and is the same product that is trusted by many law enforcement agencies. 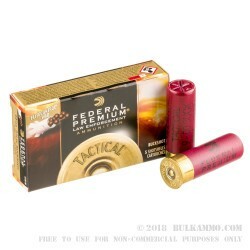 This ammo is made in Anoka, Minnesota by Federal Premium and is a great choice for self-defense or 3-gun competitions. I saw a lot of good reviews of this product. So I spent the money they asked with shipping and all, but I'm not impressed this won't cycle out of 2 of my semi auto's and its kinda poorly crimped. Please Dont Go Anywhere Else ! How often can you say that you placed your order...and it arrived boxed over for your own privacy at your door step 4 days later ? 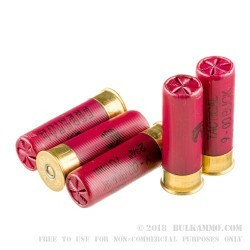 Prices are excellent for the quality of product, I would not recommend anyone else but Bulkammo.com they get the job done right the first time and at an excellent price. I have nothing but great things to say about this company they served me well and will have a loyal customer out of me and everyone I know. Thanks bulkammo ! Q: does this load have 8 or 9 pellets? A: Hi Robert, This load contains 9 pellets. Q: Any idea of the muzzle velocity of this round? A: Hello! The Federal Tactical 00 buck is listed as having a muzzle velocity of 1145 fps.